UK students serve their peers as part of the Farm-to-Fork program. Photo by Matt Barton. LEXINGTON, Ky. (March 4, 2019) — The University of Kentucky Department of Dietetics and Human Nutrition was recently recognized as a national leader in education on sustainable food systems by the Academy of Nutrition and Dietetics Foundation. The foundation named the department as one of four champion sites across the country for its ability to implement its new Sustainable, Resilient, and Healthy Food and Water Systems Curriculum for dietetic interns. “With the department being in the College of Agriculture, Food and Environment, it has allowed us to be progressive in offering education and opportunities in sustainable food systems to our students,” said Janet Mullins, interim chair of the department. The department offers a master’s degree in nutrition and food systems and an undergraduate certificate in food systems and hunger studies. 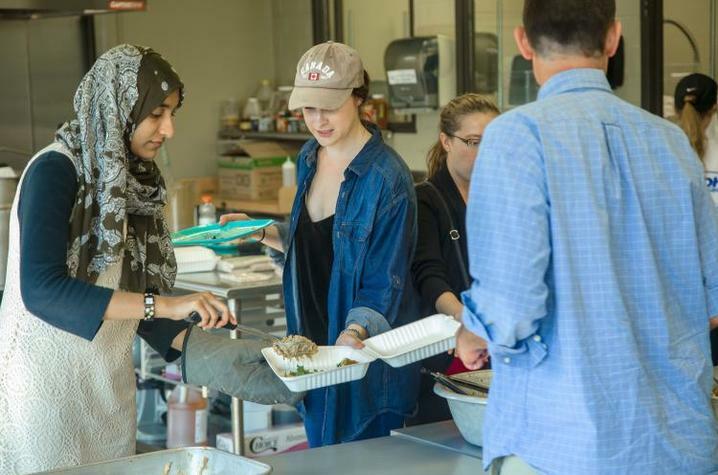 A number of students in the department play an active role in several student-led organizations, including the Campus Kitchen at UK that gather quality, unused food from community partners and make it into meals for those experiencing hunger on campus and around Lexington. Each student must complete a 1,200-hour internship to sit for the national registry exam to become a registered dietitian nutritionist. In the internship program, students work with dietitians and other professionals in the medical, food service systems and community sectors across the state. The foundation’s recognition allowed the department's internship directors Liz Combs and Aaron Schwartz to incorporate sustainable and healthy food systems education into the rigorous program at the beginning of this semester. The inclusion of more sustainable food systems education was welcome news to Morgan Barnette, a senior in the department who is working through her dietetic internship. She hopes to pursue a career in sustainable food systems after graduation.